Of all the species and cultivars within the genus, Abelia x grandiflora is arguably the most popular and widely grown of them all. It is a multi-stemmed, semi-evergreen (deciduous in cooler temperate climates), shrub, and a hybrid of Abelia chinensis with Abelia uniflora. 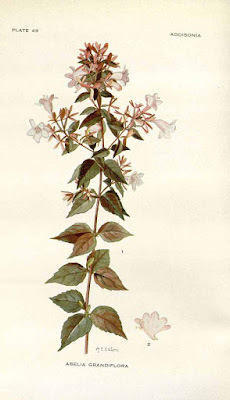 Abelia x grandiflora is superior to its parents in both its wealth of flowers and their prominence, hence its popularity. Both Abelia chinensis with Abelia uniflora are native to China. It has a vigorous arching habit which under favourable condition can produce a height and spread of between 2.5-4 metres. The typical arrangement of the dark green, glossy, oval leaves on the stem are opposite, however they can be borne in threes and fours on vigorous shoots. The fragrant blooms appear in clusters over a long period from July to October. Each flower is white, tinged with pink and followed by attractive pink-tinged sepals. It is a very easy to grow plant, yet despite its hybrid vigour is not considered fully hardy, although it will be fine in the milder southern and western regions of the United Kingdom. To flower well, and retain its characteristic dense growth, Abelia x grandiflora must have full sun. 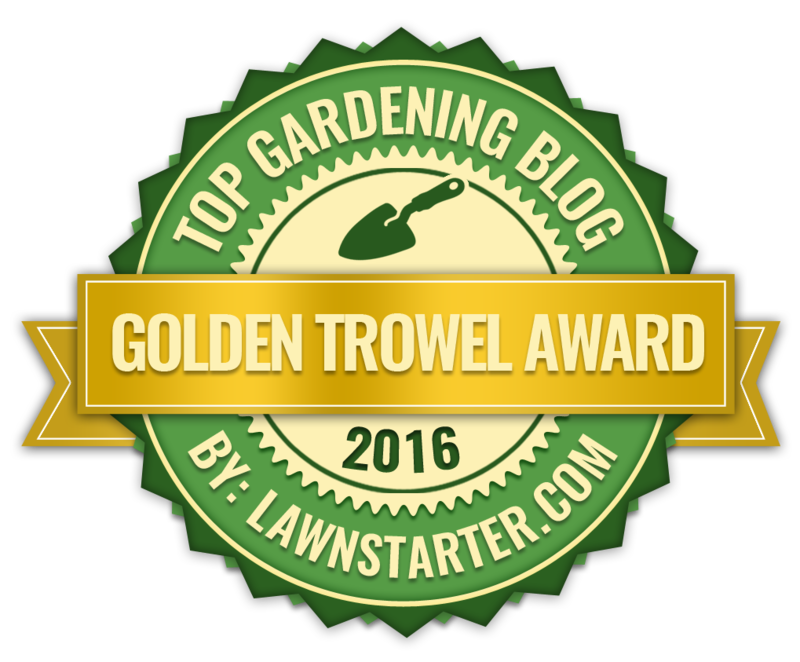 It will be happy in any ordinary garden soil, however it will require ground that is both moist and well drained. With that in mind new planted specimens will need to be watered during hot weather and periods of low rainfall. Protect new plants with horticultural fleece over their first winter. In regions with are prone to sustained, freezing temperatures consider protecting them with every year as a matter of course. 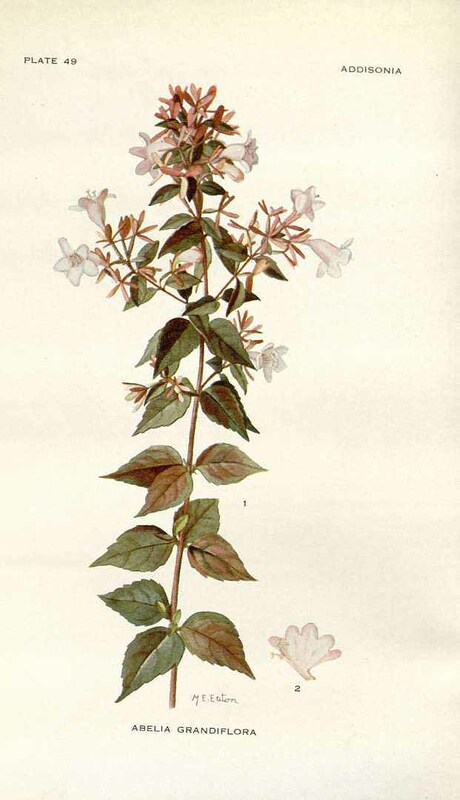 In colder climates, Abelia x grandiflora will be best planted in a sheltered position, preferably with the protection of a south or west facing wall. 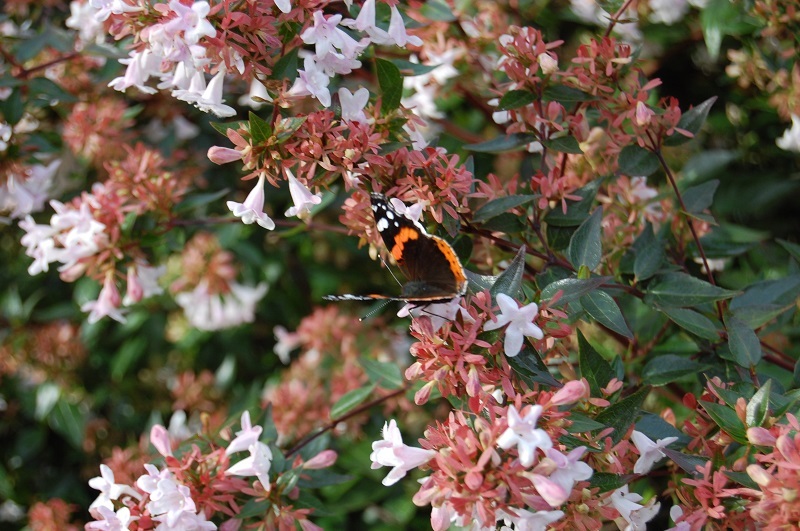 Abelia x grandiflora received the Award of Garden Merit from the Royal Horticultural Society in 1984.